I added three more rows to my double Four Patch top, which means 30 blocks. To complete it I need another 20 blocks... I think I rather have a break from this and start a new baby quilt for my three months old grandson : first priority, isn't it? As I showed in this post, my daughter chose various shades of grey for this quilt and I suppose it will be a pleasure for me to use soft neutral hues, after all those colorful fabrics lately... relaxing! I like the four patch design you are working on. I am drawn to your fabric choices. Also, I wonder what kind of sewing machine you are using. I just love the simplicity of the four patch. 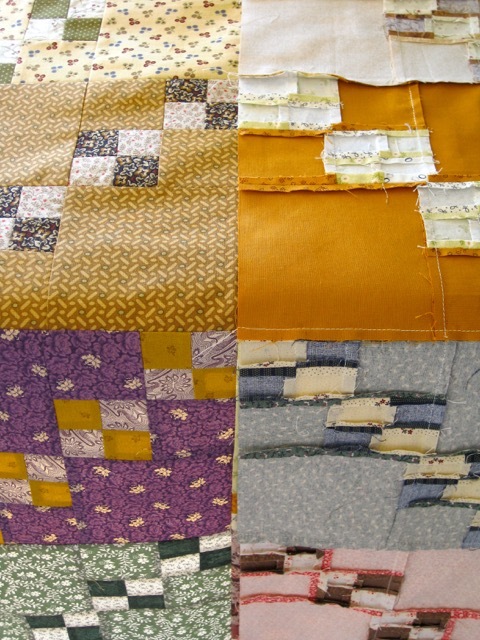 Such wonderful fabrics you are using in this, the saturated warm colors will make this a cozy quilt. I also love the photo of your sewing machine's foot. It looks as if it has a been a good friend to you and has that same sort of simplicity. Wonderful! This is the exact kind of day I have ahead of me today....good to know I'm in good company. BTW...I noticed a lot of changes in your blog! Looks like you've been busy....lot's of time and reorganization...looks good! Enjoy your change of pace. Sewing for other people is always a nice excuse to use new colors. 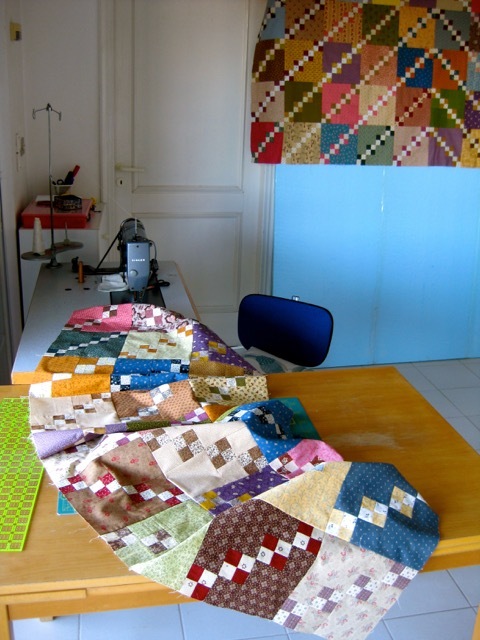 Encore 20 blocs mais ton quilt sera magnifique ! En attendant, bon baby quilt !! I like the variety of colors in your four-patch quilt! I love your Double 4 patch block. What are the sizes of your blocks? Do you have the instructions? I like it because they are tiny. Blocs finis 8" x 8"
Petits carres : 1.50" x 1.50"
Moyens carres : 2.50" x 2.50"
Grands carres : 4.50" x 4.50"
Finished blocks 8" x 8"
Interesting to see all those seams pressed open - I imagine it reduces the bulk? This quilt is on my to-do list - I've admired it for years - and since 4-patches seem to be all the rage right now I'd love to get started! Beautiful! Je comprends que tu aies envie de varier les plaisirs. Ton quilt va vraiment être superbe. Ta machine à coudre est-elle une machine professionnelle? Sa robustesse, son intégration dans la table et le mètre intégré à la table y font penser. Bon début de quilt doux. Oui, effectivement très tendances les shades of grey! Lovely photos! I so enjoy seeing your works in progress. Can't wait to see what the baby's quilt will look like. 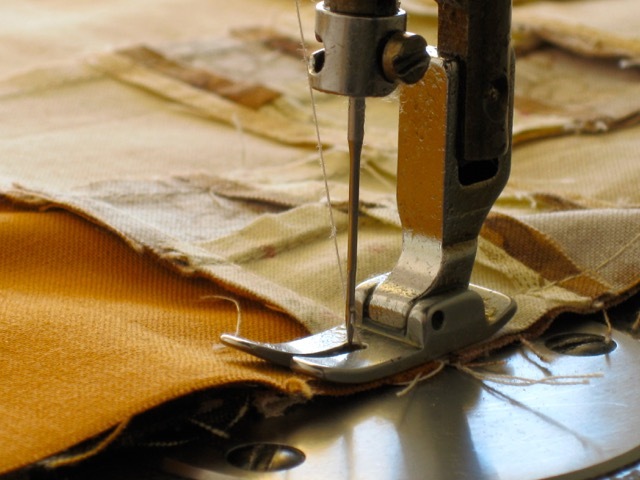 I love your window so close to your sewing. It must give you wonderful light and a joy to look outside too. Your quilt is wonderful. I love the design and colors. "double Four Patch top" like! It's looking great Christine. FYI: you left me a comment on my blog and did you know that you are a no-reply? You might want to check your settings. 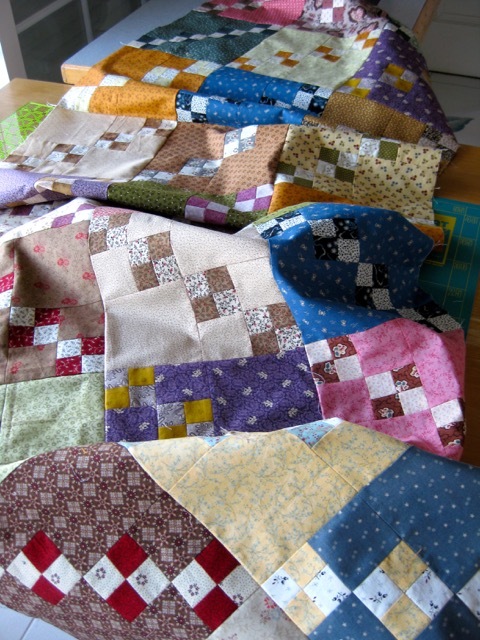 This is such a wonderful scrappy quilt! 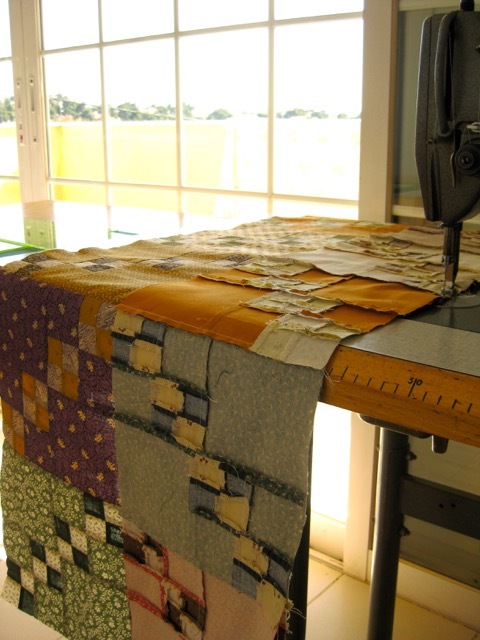 I love seeing your progress on this quilt. But I do have to admit.... Making a baby quilt for your new grandson does sound rather tempting!